Incorporating small changes into your daily routine is the best way to set yourself up for success when it comes to reaching your health and fitness goals. 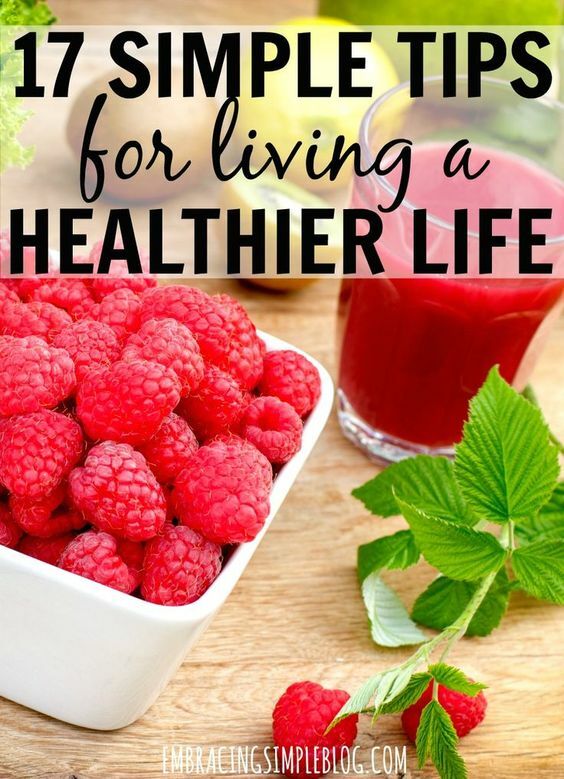 Today I’m sharing 17 simple tips for living a healthier life that I hope will empower you to feel like you can make these small changes to work towards a healthier and happier you! Drink more water. Over 60% of our bodies are made up of water and we need to make sure we replenish it! Get the amount of sleep you need to feel well-rested. Whether that’s 6 or 9 hours a night, get to bed when you need to so you can feel rested and ready to tackle the day when you wake up in the morning. Find more ways to incorporate natural products into your life. There are many natural products that can take the place of several others products you already use, and are cheaper too! For example – my 17 favorite ways to use coconut oil. Cut down on the amount of processed foods you are eating. A simple switch would be trading in canned vegetables for fresh ones. Sneak more exercise into your day. Even if that means parking on the opposite end of the shopping mall to force yourself to walk more, or taking the stairs when you can. A few extra minutes a day can add up! Let go of the negative people in your life. You will be amazed how much better you feel once you stop wasting your energy on toxic people. Eat brightly colored foods. Fruits and veggies that are brightly colored are usually packed with antioxidants. Find what motivates you in life. Read why finding your “why?” is so important. Come up with a game plan to establish healthier habits. Check out these 5 steps to establish a new habit to help you get started. Use more natural cleaning products. Cutting down on the amount of harsh chemicals you use in your home can have lasting benefits for your health – try out these easy green & DIY cleaning solutions. Make it a priority to take care of yourself when life is busy. Here are 24 great ways to take care of yourself, even when life gets a little crazy. Cut down on the amount of sugar you eat. I’m a sugar addict, so this is a hard one for me. Even super small changes like reducing the amount of sugar you use in your morning coffee or limiting yourself to one treat a day can make a big different in the long run! Find ways to relax and reduce your stress so that it doesn’t build up. Check out these 5 ways to relax after a stressful day for helpful tips. Choose complex carbs over simple carbs. This is such an easy fix to add a lot more nutrition into your diet! Swap out white bread for whole wheat, white rice for brown rice, and regular pasta for whole wheat pasta. Unplug from technology. Here are 6 reasons why unplugging from technology is beneficial. Eat smaller meals. Eating smaller, but more frequent meals throughout the day is a great way to speed up your metabolism and prevent yourself from getting that sluggish feeling that can happen when you are too full. Try these easy and healthy snack ideas for some snacking inspiration. Find ways to energize yourself other than with caffeine. As much as I love my coffee, I know that I tend to feel tired when I’m chugging too much of it to get an energy boost. Here are 7 alternative ways to energize yourself. Incorporating these small, yet effective changes into your life can help you overhaul your health without feeling like you need to make major sacrifices.